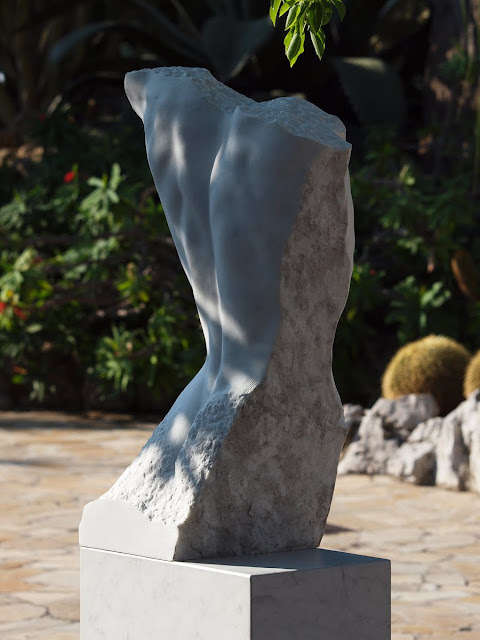 This beautiful sculpture stands near to the entrance of the Exotique Gardens and is by the well-known Monaco-based sculptor, Blake. Do click on the link to see more of Blake's stunning work which comments on our human and spiritual condition. This piece; entitled "Faith" reflects on the loss of spiritual and religious conviction in our modern lives. Blake is currently preparing a major exhibition of his work in Vancouver, British Columbia, Canada which runs from the 6 - 27 October 2011 at the Petley Jones Gallery. Click on the link for more details. This piece, and the pieces on display on the website to which you provided a link, remind me of the unfinished work of Michelangelo, with bodies ready to emerge from the marble.